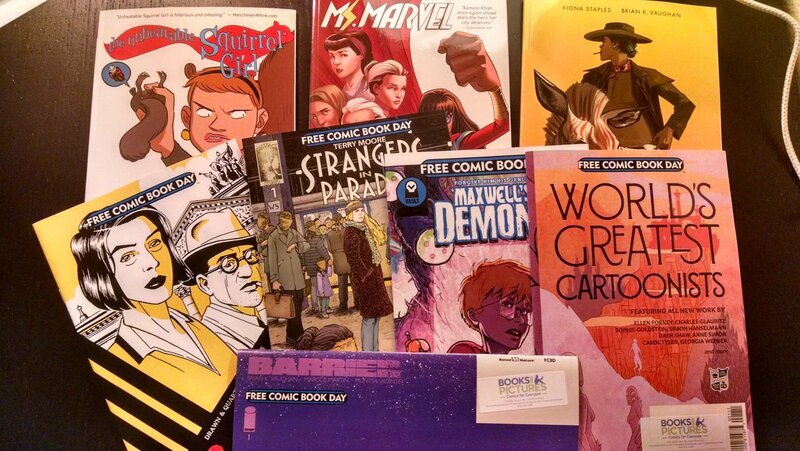 It’s May, and that means that Free Comic Book Day has come and gone, and I have a new pile of comics to talk about! Because we moved this year, I’ve been wondering for a couple months what I was going to do for Free Comic Book Day because the one downside of our new neighborhood is that it’s entirely too cool for a comics shop. Without a place that’s truly local, I had to figure out where I would trek to for the day; unlike in Athens, I actually had a ton of options for shops that I could check out, even if none of them are located super close to where I live. Eventually, I settled on checking out Books With Pictures, a local intersectional feminist comics shop that I’ve heard about from a few people who are knowledgeable about the Portland comics scene (I’m still tickled that I live in a place where there’s a comics scene at all). It required riding two buses across town and back (which was actually quite pleasant, although I almost missed my transfer because I had to look up where the stop for my second bus was after I got off the first one), so the whole outing ended up taking about two hours. The shop itself is extremely bright, which is really nice (I’ve been in some comics shops where they’re designed not to allow any natural light in, and those places always just feel super cramped and depressing) and the staff were all very friendly (they all wore paper crowns to help customers pick them out in the crowd). Like with most comics shops, they had a system in place for customers to get their free comics; when I went in I was given a paper bag with instructions to pull five free comics from the shelves and then stand in line to have a staff member seal up my bag. Because it was my first time at this shop I wasn’t really familiar with the layout, so I ended up getting in line before I’d picked out my books, so I ended up with stuff from the mature readers section at the end (my biggest regret is missing the new issue of The Tick, because New England Press always puts out a very nice standalone issue with a couple of complete stories for Free Comic Book Day). That was mostly okay though, because I didn’t see a whole lot that I was especially interested in when I looked at the FCBD inventory list ahead of time. The big draw of the day for me was taking the opportunity to buy paper copies of new trades for the ongoing series that I follow from a local independent business (I can order books from Amazon anytime, but they’re, y’know, evil, so it’s nice to occasionally be able to direct my money elsewhere). This brings me to a point that I try to make every year, but I don’t feel like I can say it often enough. The comics publishing industry is a messed up thing where publishers and distributors have managed to create a status quo where retail has to carry pretty much all the financial risk for selling product. When you walk into a comic shop, everything they have in their inventory has already been bought and paid for by them; they can’t return unsold books to the publisher the way that text-only bookstores typically can. This even includes the free issues that stores offer up on Free Comic Book Day. Comics shops are risky ventures that only survive because of dedicated patrons who guarantee a certain number of sales from month to month. It’s a bad system, but the prospects of changing it any time soon are slim to none. This doesn’t mean you have to go out and do a regular pull list to support your local (unless you have the money and interest to do that); I’ve never had a pull list, and I don’t read comics month-to-month. Read comics in whatever format you like (I’m partial to digital because it saves physical space and is much cheaper, although I will absolutely buy trades of my most favorite series–it makes it easier to loan stuff out in the hypothetical world where I know someone who’s into comics and hasn’t read what I have). The thing you must remember though is that if you enjoy Free Comic Book Day, when you go to a comics shop, you should go with the intention of buying some stuff. It’s an expensive advertising event for shops, and the only reason it continues to happen is because they hope to bring in some extra sales with it. Obviously, don’t spend more than you can afford, but be mindful that if you walk into a comics shop on Free Comic Book Day and walk out only with the freebies, that business has lost money on you. Berlin – This is a sampling of a three volume graphic novel (about to be released as a hardcover omnibus later this year) about the city of Berlin at the end of the Weimar Republic and through rise and fall of the Nazi government. This one’s going on my to-read list. Barrier – Brian K Vaughan’s name is a pretty big draw in comics right now, and this series about a Texas rancher and a man from Honduras crossing paths feels like something really interesting. I think it’s meant to be a miniseries (Vaughan has two other ongoing series at the moment, so I am very doubtful he could juggle a third), so I’m hoping to check it out later when it’s all finished and collected. The horizontal format makes for some interesting panel layouts and really emphasizes those big, wide open skies in the Texas setting. Strangers in Paradise XXV – This issue falls in the middle of a long running independent series, and a whole lot of what’s going on (there are these women who seem to be on the run from the government, among other weird things) didn’t make much sense to me as a brand new reader. The first few volumes are available on Comixology Unlimited, so I’ll go back and read some of the series’s beginning to see if it’s something I’d like to invest my time in long-term. Maxwell’s Demons – It’s a story about a ten-year-old boy genius. It’s not really my thing (the narration feels overwrought), but the art is nice. World’s Greatest Cartoonists – I have learned over the years that whatever Drawn & Quarterly puts out for Free Comic Book Day (see Berlin above) is probably worth my time, even if I end up taking a pass on reading more of it. The flipside of that is stuff put out by Fantagraphics; they’re a publisher that tends more towards the super experimental indie side of comics, and much of what they produce is just not my speed. This sampler of short stories from a variety of artists has some okay stuff, but much of it is just not in my wheelhouse. I wish I had grabbed Berlin!